Are biofuels truly sustainable? Explore biofuel sustainability in regards to the environment, economy, energy, and farming livelihood. 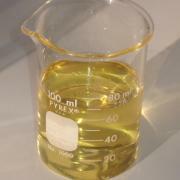 Soybean biodiesel fuel. Photo: Leandro Maranghetti Lourenço, Brazil; Wikimedia Commons. Conflicting messages: Slogans from the Renewable Fuels Association website (background) contrast with protesters’ banner (foreground). Michael Bomford montage. 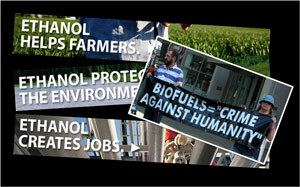 Biofuel advocates have made strong claims about the environmental and economic benefits of these fuels. Many questions and concerns have been raised, though, about whether biofuels can deliver on their promise of sustainability. To what extent will biofuels development damage soil health, cause erosion, contaminate or deplete water supplies, harm biodiversity or ecosystems, or cause open-air burning and air pollution? Will biofuels production require heavy use of fertilizers, pesticides, genetically modified organisms and monoculture crops? Does the production and use of biofuels reduce or increase the release of greenhouse gases such as CO2, methane, and N20 into the atmosphere? How much energy does it take to make a biofuel, like ethanol or biodiesel, compared to the amount of energy that is stored in the fuel, or released when it is burned? Are biofuels truly net-energy winners, reducing our consumption of fossil fuels? To what extent will increased demand for corn, soy and other energy crops lead, through increased prices, to land clearing, converting forests and grasslands into croplands and other land-use changes that cause the release of greenhouse gases? Taking the most comprehensive possible view, how do we consider and weigh all the processes and raw materials that go into the production, distribution and use of biofuels in order to assess their sustainability? Can the biofuels industry survive and maintain itself without continuing tax supports, import restrictions, mandated use and the like? Will the biofuels industry always be subject to volatile and fluctuating government policies, agricultural commodity markets and the appearance of new conversion technologies? Will biofuels production contribute to the social and economic development of rural people? Will it respect the human rights of all who are affected, including their labor, land and water rights? Or will it harm or exploit vulnerable rural people, including indigenous populations? Biodiesel: Gauging Sustainability National Sustainable Agriculture Information Service (ATTRA), 2009. Roundtable on Sustainable Biofuels: Version One of the Principles and Criteria Roundtable on Sustainable Biofuels, 2010. Biomass Feedstocks and Energy Independence discusses federal policy goals and sustainable removal of biomass from forest and agricultural lands.